Trailhead is at the end of Mountain Base Road in Goffstown, NH. Take Wallace Road from a traffic circle on Rt. 114, 0.6 miles east of the southern junction of Rt. 13 and Rt. 144 and 3.2 miles west of Rt. 114A. Drive 1.5 miles down Wallace Road and turn right onto Mountain Base Road. Follow it 0.9 miles to its end at the lake and park at the small dirt parking area near the kiosk. Walk down the dirt road past the kiosk 0.1 miles to the trails leading into the woods. Bear left in another 0.1 miles to stay on Summit Trail where Bickford Trail leaves on the right, and again 0.4 miles past that where Link Trail leaves on the right. After climbing for 0.2 miles past Link Trail, turn left onto Walker Trail. Follow Walker Trail for 0.5 miles past three viewpoints. At its end, you will intersect Incline Trail. Go right, toward the top. The top of South Uncanoonuc Mountain is occupied with cell towers and roads. It may not sound like a hiker's destination, but a loop trail that leads around the sides of the mountain provides access to five fine ledge outlooks. 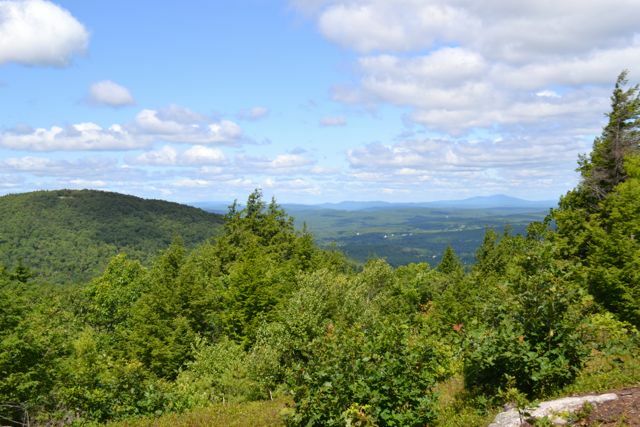 Although it is tiny even compared to southern NH hills, the prominence and isolation of the two Uncanoonucs make them landmarks on the horizon when seen from nearly anywhere in the state. The trail begins at a parking area near a small beach on Uncanoonuc Lake. As Incline Trail heads into the woods at a kiosk, walk straight for 0.1 miles on the dirt road that follows the lake. In 0.1 miles, the hiking trails lead into the woods. Bear left in another 0.1 miles to stay on Summit Trail as Bickford Trail diverges to the right. The trail climbs moderately for 0.4 miles to a junction with Link Trail (stay left on Summit Trail), then turns and climbs more steeply. In 0.2 miles further, turn left onto Walker Trail. Walker Trail immediately forks. Take the right fork, which climbs up a steep incline to the first ledgy clearing. Here, you can look across to the northern counterpart of the mountain you are on. By moving around around in this opening, you can also see the rolling hills in the Monadnock region to the left and the Lake Sunapee Region to the right. From here, turn left (facing uphill) and follow the Walker Trail to a more restricted clearing, where the other fork of the trail joins from below. You will soon reach the first viewpoint. Continuing past this area through some ups-and-downs in the forest, the trail passes the next two viewpoints, which have an excellent view of Manchester and the Pawtuckaway Mountains, along with view guides that identify the mountains you can see. Shortly after these two viewpoints (and 0.4 miles from Summit Trail), Walker Trail ends at Incline Trail, which was once a railway that brought visitors to a ski area and a hotel at the top. Turn right and follow this trail 0.1 miles to the summit area. Here, a dirt road turns right to reach the summit loop road. Continue straight, on a private road, for a short distance, then turn right onto the unsigned Summit Trail. In 0.1 miles, you reach the next viewpoint, the highlight of the hike. This large, grassy clearing has extensive views to the south, including the Boston Skyline and the Manchester Airport. Beyond this, the trail crosses Summit Road in 0.1 miles, then descends another 0.2 miles to the intersection with Walker Trail. Continue back down the way you came on Summit Trail.